Jonathan Bruce Postel (/pəˈstɛl/; August 6, 1943 – October 16, 1998) was an American computer scientist who made many significant contributions to the development of the Internet, particularly with respect to standards. He is known principally for being the Editor of the Request for Comment (RFC) document series, for Simple Mail Transfer Protocol (SMTP), and for administering the Internet Assigned Numbers Authority (IANA) until his death. In his lifetime he was known as the "god of the Internet" for his comprehensive influence on the medium. The Internet Society's Postel Award is named in his honor, as is the Postel Center at Information Sciences Institute, University of Southern California. His obituary was written by Vint Cerf and published as RFC 2468 in remembrance of Postel and his work. In 2012, Postel was inducted into the Internet Hall of Fame by the Internet Society. The Channel Islands' Domain Registry building was named after him in early 2016. Postel attended Van Nuys High School, and then UCLA where he earned his B.S. (1966) as well as his M.A. (1968) in Engineering. He then went on to complete his Ph.D. there in Computer Science in 1974, with Dave Farber as his thesis advisor. Postel started work at UCLA on 23 December 1969 as a Postgraduate Research Engineer (I) where he was involved in early work on the ARPANET. He worked there until 24 August 1973 when he left to join MITRE Corporation. He assisted with Network Information Center which was being set up at SRI by Elizabeth Feinler. In March 1977, he joined the Information Sciences Institute at the University of Southern California as a research scientist. Postel was the RFC Editor from 1969 until his death, and wrote and edited many important RFCs, including RFC 791, RFC 792 and RFC 793, which define the basic protocols of the Internet protocol suite, and RFC 2223, Instructions to RFC Authors. Between 1982 and 1984 Postel co-authored the RFCs which became the foundation of today's DNS (RFC 819, RFC 881, RFC 882 and RFC 920) which were joined in 1995 by RFC 1591 which he also co-wrote. In total, he wrote or co-authored more than 200 RFCs. Postel served on the Internet Architecture Board and its predecessors for many years. He was the Director of the names and number assignment clearinghouse, the Internet Assigned Numbers Authority (IANA), from its inception. He was the first member of the Internet Society, and was on its Board of Trustees. He was the original and long-time .us Top-Level Domain administrator. He also managed the Los Nettos Network. All of the above were part-time activities he assumed in conjunction with his primary position as Director of the Computer Networks Division, Division 7, of the Information Sciences Institute at the University of Southern California. 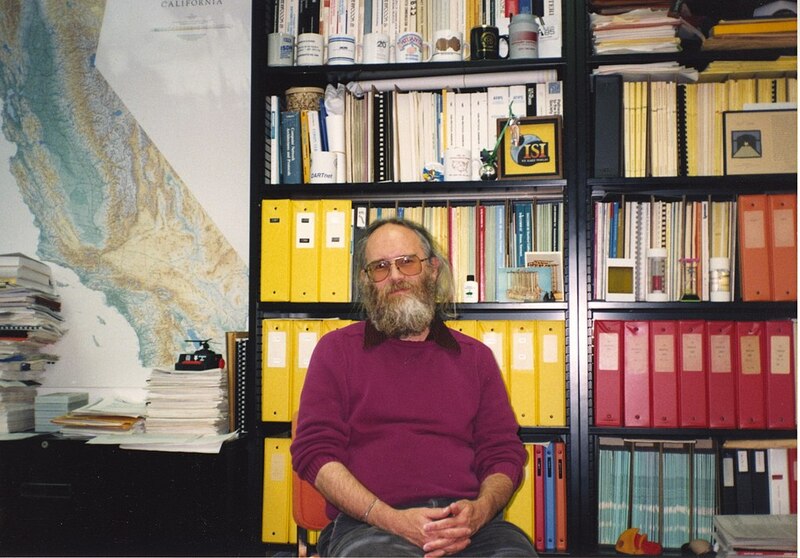 Postel in 1994, with map of Internet top-level domains. 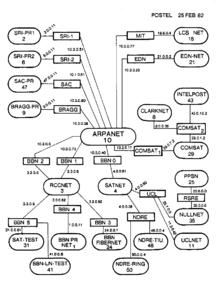 On January 28, 1998, Postel, as a test, emailed eight of the twelve operators of Internet's regional root nameservers on his own authority and instructed them to change the root zone server from then SAIC subsidiary Network Solutions (NSI)'s A.ROOT-SERVERS.NET (198.41.0.4) to IANA's DNSROOT.IANA.ORG (198.32.1.98). The operators complied with Postel's instructions, thus dividing control of Internet naming between the non-government operators with IANA and the 4 remaining U.S. Government roots at NASA, DoD, and BRL with NSI. Though usage of the Internet was not interrupted, he soon received orders from senior government officials to undo this change, which he did. Within a week, the US NTIA issued A proposal to improve technical management of Internet names and addresses, including changes to authority over the Internet DNS root zone, which ultimately, and controversially, increased U.S. control. On October 16, 1998, Postel died of complications from heart surgery in Los Angeles, nine months after the DNS Root Authority incident. He was recovering from a surgery to replace a leaking heart valve. The significance of Jon Postel's contributions to building the Internet, both technical and personal, were such that a memorial recollection of his life forms part of the core technical literature sequence of the Internet in the form of RFC 2468 "I Remember IANA", written by Vinton Cerf. Perhaps his most famous legacy is from RFC 760, which includes a robustness principle often called Postel's law: "an implementation should be conservative in its sending behavior, and liberal in its receiving behavior" (reworded in RFC 1122 as "Be liberal in what you accept, and conservative in what you send"). ^ "2012 Inductees". Internet Hall of Fame. 2012. Retrieved 24 April 2012. ^ "Delegation Record for .GG". www.iana.org. Internet Assigned Numbers Authority. 8 March 2016. ^ "Delegation Record for .JE". www.iana.org. Internet Assigned Numbers Authority. 8 March 2016. ^ Hafner, Katie; Lyon, Matthew (1996). Where Wizards Stay Up Late: The Origins of the Internet. Simon & Schuster. p. 137. ISBN 0-684-81201-0. Steve Crocker and Vint Cerf had been best friends since attending Van Nuys High School in L.A.'s San Fernando Valley.... While Cerf and Crocker were academic stars, Postel, who was twenty-five, had had a more checkered academic career. He had grown up in nearby Glendale and Sherman Oaks, and he too had attended Van Nuys High School, where his grades were mediocre. ^ "USC Memorial Tribute for Jonathan B. Postel". University of Southern California. November 5, 1998. Archived from the original on May 21, 2011. Retrieved April 8, 2011. "Jon Postel Biography". isi.edu. June 5, 1997. Archived from the original on December 6, 1998. Retrieved April 8, 2011. "USC/ISI Computer Networks Division ("Div 7")". isi.edu. Archived from the original on August 17, 2005. "Remembering Jonathan B. Postel". postel.org. Archived from the original on April 24, 2001. "In Memory of Jon Postel". isoc.org. Internet Society. Calverley, Bob; Krieger, Dianne (Spring 1999). "Jonathan B. Postel 1943–1998". usc.edu. USC Trojan Family Magazine. Archived from the original on October 23, 1999. Retrieved April 8, 2011. Gittlen, Sandra (February 4, 1998). "Taking the wrong root?". NetworkWorld.com. Archived from the original on March 8, 2012. Gittlen, Sandra (February 9, 1998). "Surprise IP address system test creates a stir". Network World. Gerwig, Kate (February 9, 1998). "One Man's Attempt to Reroute Internet Traffic". InternetWeek.com. Archived from the original on October 5, 2011. Cave, Damien (July 2, 2002). "It's time for ICANN to go". Salon.com. Archived from the original on July 22, 2011. Farber, Dave (July 2, 2002). "a comment on Gilmore: ICANN Must Go (good insights)". Interesting-People. Archived from the original on May 25, 2010. ^ Bridis, Ted (AP) (February 5, 1998). "Internet reconfiguration turns out to be rogue test". The Daily News (Kentucky). ^ "A proposal to improve technical management of Internet names and addresses. Discussion Draft 1/30/98". NTIA.org. January 30, 1998. Archived from the original on February 7, 1998. This page was last edited on 14 February 2019, at 01:24 (UTC).